Mionix teases the Naos QG, a new gaming mouse with the Pixart PMW-3360 sensor and seven fully programmable buttons. It features 5-step DPI switching with a maximum setting of 12,000dpi, it has two LEDs in two color zones with light effects and up to 16.8 million color options, and profile management. Once of the special features of this mouse is that it measures biometric information and movement data via integrated sensors and visualizes the captured data through an in-game overlay. In particular, the mouse features a sensor that allows you to track your heart rate, supposedly this can serve as a metric in regards to your level of excitement when you're streaming your game experience. 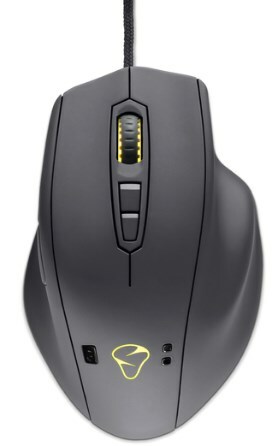 Mionix today announced the launch of the Naos QG (Quantified Gaming) mouse. The mouse lets users monitor and share their body reaction in real time. Mionix new gaming mouse is developed in collaboration with Kickstarter and the Twitch streaming community. The Mionix QG mouse measures the user’s biometric information and movement data via integrated sensors and visualizes the captured data through an in-game overlay. The Naos QG (Quantified Gaming) is a next generation gaming mouse that measures the user’s biometric information and movementdata. By monitoring heart rate and activity in real time via multiple sensors, the Naos QG provides valuable, interesting and fun insights that create a richer user experience. Downloadable Mionix Hub configuration software lets users fully customize their Naos QG and review the data captured over a selected period. This makes it easy for users to analyze their behavior over time and identify patterns. The data is stored and can be shared through social media channels. The sophisticated software is complemented by an in-game overlay that shows heart rate and relevant data during games and desktop applications and makes the Naos QG an unique tool for streamers and video creators. The Naos QG features a set of APIs that is open to developers. Users can easily create their own applications or mods to unlock the full potential of the Naos QG. 128kB onboard memory allow storage of data directly on the mouse and a lightning fast 32bit ARM™ Cortex M3 processor enables theNaos QG to have many features without compromising the tracking ability of the optical sensor. Its unique award winning ergonomic shape is developed for a full palm grip with support for all five fingers and the new dark grey four layer rubber coating makes it a pleasure to use and an eye catcher on the desk. The Naos QG sports the new PMW-3360 optical sensor with no positive or negative hardware acceleration, amazing accuracy, smooth tracking, and a maximum speed of 7.6m/sec (250 IPS) all the way up to 12000 DPI. The Naos QG starts shipping in October for 129EUR ($129).